What does Governor Brown do when her administration doesn’t want to hand over public records? She defends a months-long runaround while the Legislature exempted the very same records the Department of Human Services was trying to hide. 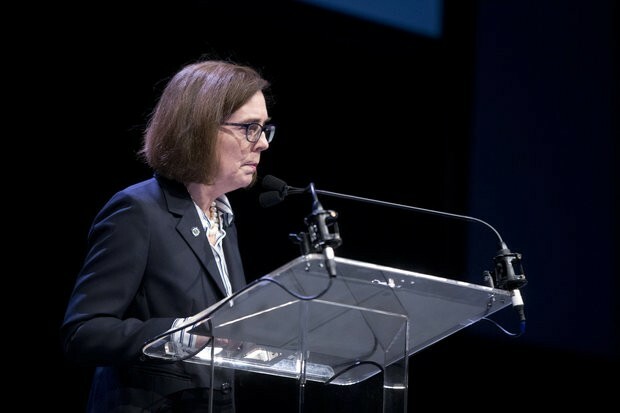 There’s something Oregonians should know about the governor who,in her Feb. 18 inaugural speech, emphasized the need to “restore the public’s trust” in state government, to which end “We … must strengthen laws to ensure timely release of public documents.” What Oregonians should know is that these are just words, and hollow ones at that. A telling episode in 2015 reveals that Kate Brown’s commitment to transparency is no deeper than your average puddle. In August. The episode, which we discussed in an editorial earlier this month, involved the state Department of Human Services, which deliberately dragged out its response to a public records request for months while the Legislature worked to exempt the requested material from public disclosure. Then, one day after Brown signed the bill, a DHS official emailed the requester to explain that her request was now moot. Talk about rubbing it in. While the request was handled by DHS, its existence was made known to the governor’s office, for which the episode’s timeline could not be more embarrassing – and telling. The request was made on Dec. 17, 2014, by Anne Marie Gurney, who is the Oregon coordinator for the Washington-based Freedom Foundation. The nonprofit is concerned about the power of public employee unions. Gurney requested a CD containing the names and addresses of all home health care providers in Oregon. Her purpose, she says, was to let these people know their rights under a 2014 U.S. Supreme Court decision, Harris v. Quinn, which determined that workers in their position are not public employees and, thus, not required to pay certain union fees. The information Gurney requested was, at the time, subject to public disclosure. In fact, the state maintained a searchable database of home health workers, which Oregonians who needed their services could use to find a match. The information was neither sensitive nor, at the time, controversial. Why? Because, said Evans, officials “did not want to disclose information that may soon be protected from disclosure.” Franz Kafka could not have said it better. The fate of Gurney’s request, which was filed during Kitzhaber’s tenure, is exactly the kind of abuse against which Brown appeared to rail in her inaugural speech. And a governor who claimed to support the strengthening of laws to ensure the timely release of public documents would never defend a strategy of delaying the release of public documents while public records laws were weakened. Or would she? We asked Brown’s office to weigh in after reviewing emails, obtained through public records request, that show Pirtle-Guiney’s involvement in the records runaround both before and after Brown’s “ain’t-transparency-great” inaugural speech. On Feb. 27 – fewer than 10 days after Brown’s address – Evans forwarded to Pirtle-Guiney an email in which he promises Gurney, among other things, that “Your request is in process.” That’s one way to put it. Pirtle-Guiney responded on March 2 by asking Evans to “Let me know what you hear back from the DOJ.” Three days later, Evans wrote, “Erinn (Kelley Siel) said you had asked about a timeline” and attached his phone number. Translation: Maybe the governor knew. Maybe she didn’t. So what? And then the governor’s spokesperson defends DHS’ records runaround. “The request you refer to involved publicly sharing individuals’ personal information, such as names, home addresses, and personal/home telephone numbers. This had serious implications for the expectation of privacy for these individuals and their families.” Gurney, again, requested only the names and addresses of home health workers, not their phone numbers, as Grainger claims. In any case the “serious implications” of Gurney’s request were this: That home health care workers would be notified of their rights. The horror! If Brown meant what she said Feb. 18, she would not have tolerated the public-records abuse in which her workforce and labor policy adviser was complicit. Nor would she now be defending it. She’d also be willing to say whether she knew about it. It couldn’t be more clear, however, that Brown’s avowed commitment to transparency was nothing more than inaugural window dressing.